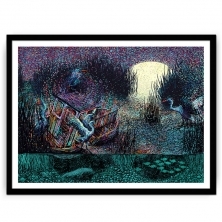 James R. Eads was born and raised in Los Angeles, CA and began drawing at a very young age. After graduating from high school, James went on to study art at Skidmore College in Upstate New York. While there he was honored with several awards and graduated with a focus in printmaking and painting and the juried award of best senior exhibition in his class. James then migrated to Brooklyn, where he held onto a variety of artistic internships and jobs before moving back to Los Angeles to pursue art full time. In the past two years James has combined his love for printmaking and painting into a single art form: digital painting with an emphasis on high quality limited edition prints. James now runs his own (very small but suitable) printshop where he can print his own high quality giclees and retain maximum control over color and quality. When everything collides perfectly, he can use his artistic background to illustrate for musically related projects and has since begun to take on gig poster illustration. James has worked with clients such as Phish, Edward Sharpe and the Magnetic Zeros and Andrew Bird.